The arm of a small Amygdala Great One. any sort, but certain madmen wield them like clubs. when extended, the arm quivers as if it were still alive. 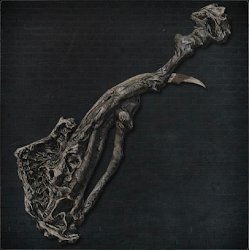 The Amygdalan Arm requires a hefty 17 strength to use. So while all characters by default meet the minimal skill requirement of 9 for this weapon, an investment in strength is necessary to wield it. Accordingly, this weapon scales best with strength, and receives excellent ratings at higher levels of upgrade. The normal moveset of this weapon is most effective against singular foes, whereas the transformed moveset is best applied against groups of enemies. The dual nature of this weapon makes it fairly adaptable between situations. In addition, this weapon inflicts a solid amount of arcane damage in both modes and scales moderately well with the stat. This is a valuable option for hunters focusing on strength and arcane. Normal Mode: The Amygdalan Arm's normal mode is very straightforward. The majority of its attacks are short, heavy swings aimed immediately ahead of your character. This mode is best suited for close combat with single foes; however, the windups are slow, which limits its use against more evasive targets. This mode deals almost exclusively blunt damage, making it useful against enemies weak to this particular type. Transformed Mode: The Amygdalan Arm's transform mode is quite superior to its normal mode. It has far better reach and uses a similar amount of stamina with each attack. In fact, it will suit most situations much better due to its wider variety of moves. If you are fighting crowds or enemies resistant to blunt damage, transformed mode is the way to go. Normal: Treasure in Hunter's Nightmare, after the Grand Cathedral area where you go to the right into the tunnel. Follow it down until you reach the blood pools with all the spiders. Head to the right side of those blood pools (behind the car is a path) and there will be a tunnel. Clear the enemies [Blood-starved Beast] inside of the cave and the Amygdalan Arm will be in there to the right. Equipping an elemental gem will not convert the Amygdalan Arm's physical damage to elemental, nor can it be buffed with the use of items. Tempering gems can be used to increase the damage of blunt attacks, but they won't affect your arcane damage. Instead, consider using Nourishing gems; these are a much better use of your slots and will increase your damage overall. If you are without Nourishing gems, Arcane and Odd Arcane gems with physical attack increasing secondary effects can be used to supplement its already good arcane damage. Radiant gems are another good use of your slots, as they will offset its above average stamina usage. 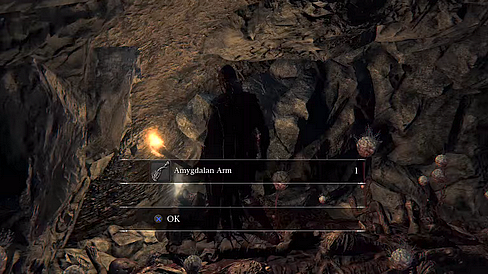 Also note that the Amygdalan Arm has two powerful charging attacks that can be greatly improved with Striking gems. For more information check the Best Blood Gem Setups page. Normal Mode: While lacking in speed and range, each hit will remove a solid amount of enemy super armor; you can use this to lock most normal enemies into the Amygdalan Arm's R1 chain. However, this is not recommended against sturdier enemies, who will strike back before their super armor's breaking point. In these instances, swift, single blows such as quickstep R1s will suffice. The charged R2 is especially powerful, but takes a long time to fully charge. An upside to the long charge is that it gives plenty of time for you to change its direction. This attack can stagger enemies from behind, opening them up for a rear visceral attack, but you may instead want to use its powerful follow up R2. Both attacks have massive impact, giving ample time for the follow up while enemies are grounded from the first - just be sure to conserve your stamina to use it. The dashing R2 has a good damage multiplier and decent swing speed. The main drawback to this attack is in its long recovery; this won't be much of an issue against most enemies thanks to its high super armor reduction and impact. Take note, the transformation attack is one of this mode's more useful tools; it has good speed and heavy impact, making it ripe for longer combos. Transformed Mode: The first two swings of the R1 chain hit in wide horizontal arcs that are exceptionally, good for handling multiple enemies. In this situation, however, you'll want to back out rather than continue, since the following two swings move vertically. One of best features of these of attacks is that, despite their wide range, they can be swung freely without the repercussion of bouncing off walls. The R2 of this weapon is an odd one, but that is precisely its strength! If you perform no other actions, including movement, a second surprise hit will execute after the initial slash; if the first hit doesn’t break your target's super armor, this additional one will usually do the trick. Another easy way to break super armor is by using the leaping R2. When facing enemies with high amounts of super armor, use this as a follow up attack to ensure they are stumbled during your recovery. The charged R2 uses the same gimmick as the standard R2, but is by far the dirtiest move this mode has to offer. On top of dealing high damage, the massive impact of this attack will send enemies straight to the ground. If you stand idle after, your character will perform two delayed slashes made for hitting enemies as they recover. This deals a lot of damage and can cause enemies to stumble more than once. For even better damage, immediately follow the charged R2 with a massive impact transformation attack. Durability of the weapon depletes when used. This means hitting an enemy, destructible object or bouncing off the walls. Hitting undestructible objects and environment does not deplete your durability. Style of an attack or upgrade of the weapon, even different weapon, does not matter - each count as one hit. Every 10th hit against the enemy/object depletes 1 durability. Exception is Tonitrus, which when in self buffed mode, depletes durability at rate of 2 hits. Hitting an enemy in dying animation still counts as hit. Also hitting multiple enemies/destructible objects at once counts as one hit per enemy - hitting 3 enemies at once counts as 3 hits towards durability counter. Shields lose 1 durability every 10th hit. Bounce means when your hit is bounced back off the wall or other objects. Every 5th bounce depletes 1 durability. Not every weapon can be bounced off, Amygdalan Arm belongs into the category which cannot. Damage reduction when heavily worn. When weapon is at 30% of total durability, it reaches the Risk state and AR is reduced by 30% and when it hits 0% of total durability, weapon is Broken, then AR is reduced by 50%. Amygdalan Arm which has 200 points of durability reaches risk state at 60 Dur. Workshop's Repair: cost of repair depends on the weapon and its upgrade. 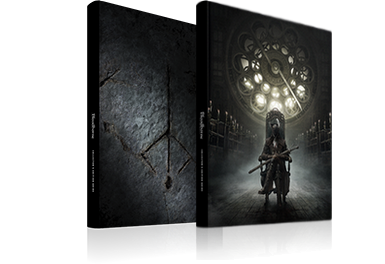 For Amygdalan Arm +0 it's 2 Blood Echoes per 1 point and for Amygdalan Arm +10 it's 8 (values are rounded), full repair costs for +10 are 1600 Blood Echoes.